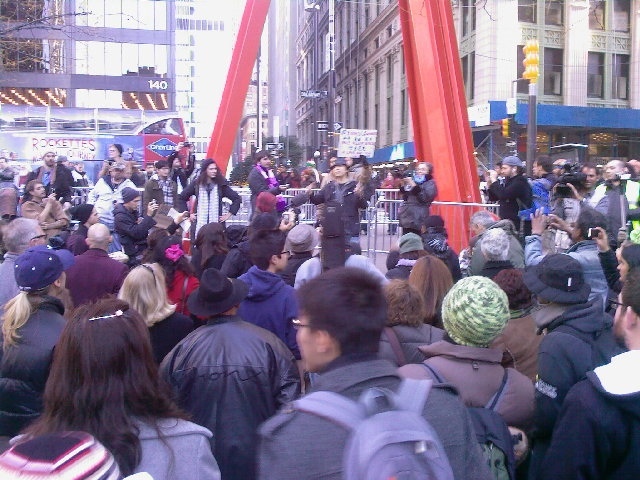 Honored to be invited to speak at Zuccotti Park using the now iconic people’s mic of the Occupy Movement. The content is largely what I’ve learned from and been inspired by the movement. Zuccotti Park/Liberty Plaza is not Tiananmen. And America is not a dictatorship, we can still change this country peacefully. I’m an exiled student from TIANANMEN 22 years. were saved by NATIVE AMERICANS. You inspired me to be part of this. of the beginning of a great nation. Like our forefathers – with a new-born Nation. Occupy is in our infancy. Doesn’t this baby cry loud! We are thankful to other 99%ers. we are even thankful to the 1%ers. – You, the middle class. Don’t keep your heads down – don’t just get along. Step up and occupy — step up — STEP UP — and restore our democracy, to restore the American Dream. We call upon all 99%ers — to step-up and occupy. This is the beginning of the beginning for this great nation once again! The people united, will never be defeated. This is the beginning of the beginning for this great nation. We are unstoppable, another world is possible! This entry was posted on Thursday, November 24th, 2011 at 3:27 pm and is filed under #OWS, Commentary, English, Social Movement. You can follow any responses to this entry through the RSS 2.0 feed. You can leave a response, or trackback from your own site. I find it all very inspiring.